New requests for aid could raise the costs of Japan’s continued cooperation with the Hermit Kingdom. On Thursday, The Nikkei reported that North Korea has requested a further easing of Japanese sanctions in addition to humanitarian aid in return for its initial report into the fate of Japanese citizens abducted in the 1970s and 80s, expected in early September. These requests were certainly something that were discussed in negotiations earlier this summer when the investigation began. However, Pyongyang’s specific requests before the report is even issued could put Japan in bind, as well as make continued negotiations difficult if North Korea does not receive a response it deems satisfactory. While Japan has eased some sanctions on North Korea already, Pyongyang appears to be looking for further assurance that not only will more humanitarian aid be forthcoming, but also for a widening of sanction relief beyond lifting travel restrictions or allowing North Korean ships to enter Japan for humanitarian purposes. 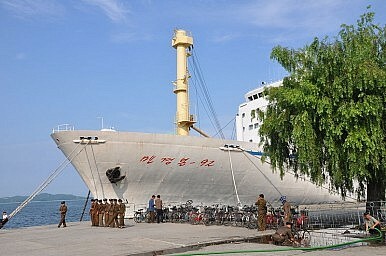 Specifically, it is probably looking for unrestricted access for the Mangyongbong-92, a passenger ferry that used to connect the two countries and was used by ethnic Koreans in Japan to visit North Korea. 1) How likely North Korea is to submit a report deemed satisfactory by the Japanese public and its government. 2) The domestic political cost of being seen as giving into further North Korean demands before real progress is made and results are proven. 3) The effect it will have on Japan’s relations with South Korea and the U.S. Considering how important the issue of the abductees has become to Prime Minister Shinzo Abe (it is one of the few popular government initiatives this summer, in contrast to the tax increase, the reinterpretation of collective self-defense, and the possible restart of some of Japan’s nuclear reactors), he may feel constrained to send reassurances to Pyongyang in order to keep the investigation on track. For its part, North Korea is showing the effects of its isolation from its traditional ally China in again asking for aid before the report, which is due within a month, is finished. Japan has also repeatedly tried to reassure its American and South Korean allies that these negotiations will not alter its support for U.N. Security Council sanctions. During a rare meeting between Japanese Foreign Minister Fumio Kishida and his North Korean counterpart Ri Su Yong in Myanmar last weekend, Kishida was clear that North Korea must abandon its ballistic missile and nuclear weapons programs before substantial aid and sanction relief can take place. Japan cannot risk being seen as overly disposed to giving in to Pyongyang’s requests over an issue that does not affect its strategic interests. Abe will have to judge how important this issue is to him politically, and how likely North Korea is to derail the investigation should assurances not be forthcoming.